A teachers' strike in Arizona looks as if it will enter a fourth day Tuesday after educators swarmed the Capitol on Monday demanding lawmakers increase education spending. 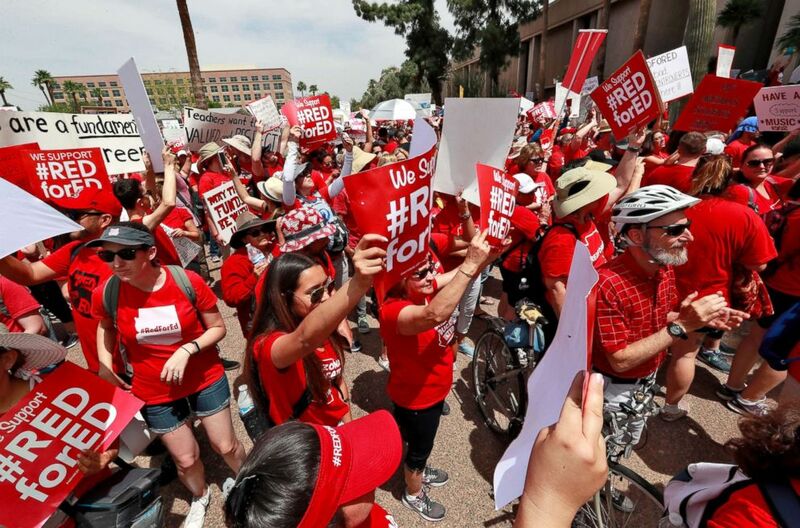 The teachers, most wearing #RedforEd T-shirts, gathered in downtown Phoenix for a rally before marching to the governor's office nearby, led by a student marching band. "Now it comes down to the hard work of being a citizen, an active, engaged citizen," Joe Thomas, president of the Arizona Education Association, told the striking teachers from a stage in front of the Capitol. "And so you've got to tell your story. The story of your students. The story of this movement." Teachers rally outside of Arizona Gov. Doug Ducey's Executive Tower Monday, April 30, 2018, in Phoenix on their third day of walk outs. 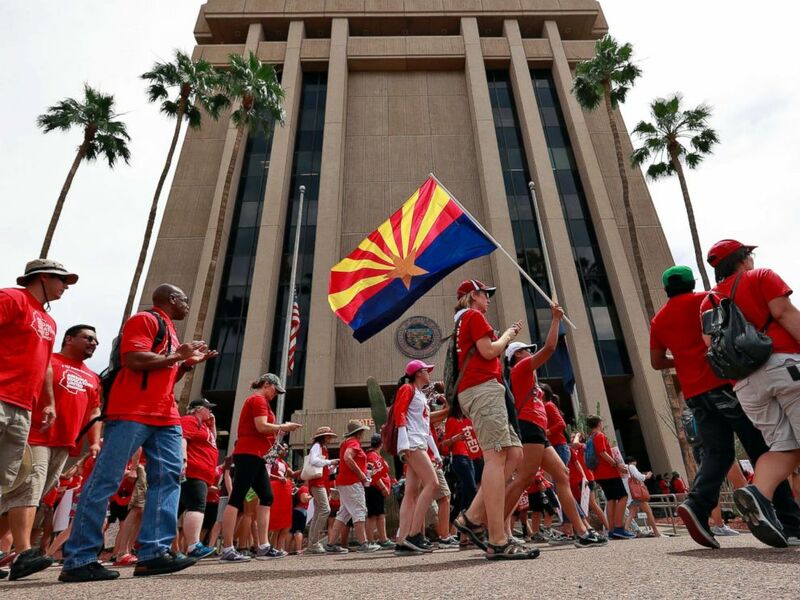 About 50,000 public-school teachers in Arizona began their strike on Thursday. They're seeking a 20 percent increase in pay and $1 billion in educational funding, including increases to salaries of school support staff. Arizona Gov. Doug Ducey has proposed granting teachers a 20 percent raise by 2020 and budgeting an additional $100 million for new textbooks, building improvements and support staff. The governor proposed increasing educational funding by $371 million over five years. The teachers have insisted Ducey hasn't showed them his proposal's fine print, even as lawmakers began debating it Monday. "We've not seen a lot of trust with the legislative process, and the governor so far," Thomas told ABC station KNXV-TV on Monday. He said it was unclear how long the strike will last and that a lack of transparency throughout the process wasn't helping matters. 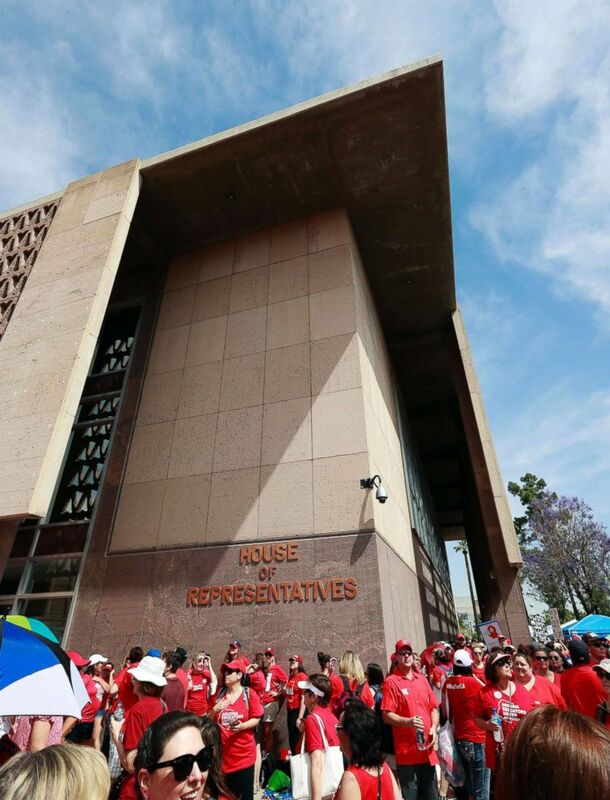 Teachers rally outside the Arizona House of Representatives Monday, April 30, 2018, in Phoenix on their third day of walk outs. "If we see the legislative bills early and can have an understanding of them, then maybe that moves us back toward the classroom," Thomas said. Public educators in Arizona rank 46th in the U.S. in teacher pay, earning about $12,000 less than the national average of $59,660, according to a 2018 report by the National Education Association. Arizona spends about $4,500 less than the national per-pupil average of about $12,000, ranking 48th, according to the NEA report. The Arizona teacher's strike is the latest by educators across the country who've said they're fed up with cuts to educational funding. Oklahoma, West Virginia, Kentucky and Colorado have all seen recent teacher strikes.